In a small bowl, mix the salt, lemon juice, garlic, thyme, oregano and parsley together. Rub the mixture onto the chicken skin. Please the chicken into a large mixing bowl and cover with plastic wrap. Refrigerate the chicken overnight. 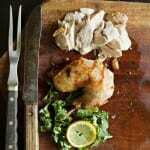 Prick the lemon with the forks and place it, the oregano and thyme sprigs inside the chicken. Then Rub olive oil all over the chicken. Place the chicken into a roasting pan and drapes it with aluminum foil. Roast the chicken, covered for 45 minutes. Remove the four oil and roast a chicken until it is done, about 30 additional minutes.